Discussion in 'News & Announcements' started by CM Yukimura, Feb 12, 2019. Date: Wednesday, February 13th 2019. Dark Rifts will be added. War Hero system will be added. New NPCs for NPC Dating will be added. Various events for Valentines will be added. Follow us on Twitter/Facebook to stay up to date. We apologize for the inconvenience and we ask for your generous understanding. *Weekly maintenance will be extended until further notice. We apologize for any inconveniences this may cause you. *Maintenance has finished and servers are back again. Kibb, Reverielle, Who_Me and 3 others like this. Dark Rifts whats that! Sounds lewd! From tomorrow, the beautiful world of Black Desert Online will be troubled by the mysterious Dark Rifts that will appear randomly across the world. From the Rifts, powerful boss monsters that have been consumed by the elusive Black Spirit will appear. They can be challenged individually only and can yield wonderful rewards if a player is successful in defeating the foe. Unlike most MMO’s, this challenge is intimate, lonely and if unsuccessful, deadly! These mysterious occurrences will surprise and enthuse players when they are simply minding their own business during regular gameplay and adds another layer of depth to the celebrated MMORPG that is Black Desert Online. For those (un)lucky enough to miss the rifts, a location finder will be added to the map to make sure no one misses out on the action. Azu_Raged and MishkaII like this. Boss monsters that only you can see will spawn arround the world they drop accesouries and Evil desire. no its participating in nodewar/siegewar for other guilds. like a "bodyguard"
Mercenary system. They haven't made anything for sending out alts, since their focus now is the Territory war between calph and valenica. Maradino, Koex, Tvvin and 7 others like this. Boss monsters dominated by Black Spirit have been summoned to the world of Black Desert. - If you have at least one character that has completed [Adventure Complete] Journey in Mediah, the Crack of Darkness will open. - Crack of Darkness in Valencia will open when you complete [Adventure Complete] Journey in Valencia. - Only the boss monsters in Balenos, Serendia, Calpheon, Mediah, and Valencia will appear for now. - System message will be displayed when Crack of Darkness appears and the location will be marked on the world map. - You can get a box that gives accessories by chance when you defeat the boss monsters dominated by Black Spirit. - Boss monsters dominated by Black Spirit is only visible to you. Party members or other players cannot attack them. - There are no death disadvantages from dying. - The monsters will not disappear when you disconnect or change server. - The monsters cannot be attacked during Node/Conquest war. You need to change your server in order to attack them. You can get Evil Desire of Black Spirit by defeating the boss monsters dominated by Black Spirit. You can exchange the item with the following rewards. 10% 20% 50% Rage Skills when? KrimsonSky, Tvvin, Ruffe and 5 others like this. Date: Thursday, February 13th 2019. 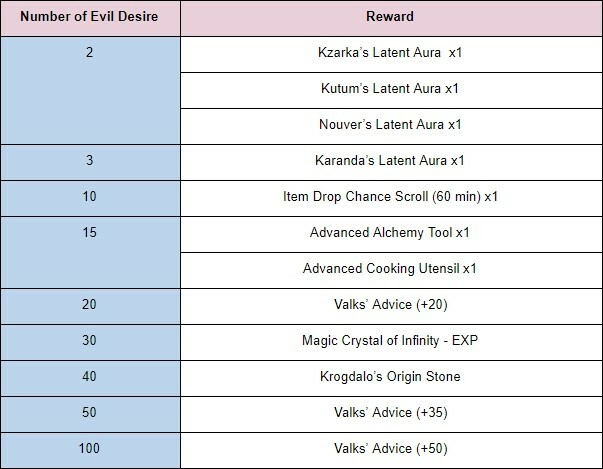 Im actually excited for the dark rifts....the rewards look very nice. +50 Valk? Yes please!! & Ty. Whut, who we dating? Crio still hasnt returned my phone calls. Dark rifts?. Is it related to savage rifts. Because savage rifts Are no longer been used due to afk trolls in them ect. Thursday is the new Wednesday now? DeltaTiger and Lynching like this. Tvvin, Wodur and DaNewb like this. This game is taking ideas here and there, now it's Metin 2 with Metin Stones that pop out of nowhere, an interesting idea if also the cash shop model wouldn't follow the one of free to player games. Findubar, Oaklay and Ruffe like this. So I'll either miss them cause I'm going 100km/hr with my horse, auto pathing to my destination or lifeskilling on a safe zone, more wholesome content for everybody to enjoy /s, got it. Ghost of Kirin likes this. Lemomn and Mgp like this. Black Desert Online is a game developed by Pearl Abyss, a Korean company, and licensed for Oceania, North America and part of Europe by Kakao Games Europe B.V.
© 2017 Kakao Games Europe B.V.